Our SME family is passionate about helping others and improving the communities where we live and work. Through community service, strategic partnerships and community investment, we aim to create positive, sustainable change. By giving our resources and ourselves, we build stronger communities. Annually, a team of SME volunteers organizes a golf tournament to fund a scholarship in memory of a long-time SME pavement engineer, Starr Kohn, PhD, PE, who passed away suddenly in January, 2009. Starr began his career at SME in 1978 and, along with the great team he built in our Pavement Services group, helped advance pavement research and technologies throughout the Midwest, nationally and internationally. For over 30 years, he was dedicated to his passion, pavement engineering excellence. The strong work ethic, intellect and quality standards he brought to his work eventually propelled him to positions as Principal, Senior Vice President, Group Leader for Engineering Services, and appointment to the SME Board of Directors. Starr was fiercely devoted to his staff and always put their needs before his own. He demanded excellence and innovation, and challenged them to “think outside the box” on every project. He gave generous praise for exceptional work. And, in return he was rewarded with fierce loyalty and respect. In Starr’s honor, a goal was set to raise $20,000 over a three-year period to establish a scholarship fund in his name through the Community Foundation of Plymouth for University of Michigan Civil Engineering students. On May 29, 2009 over 80 golfers attended the first annual Starr D. Kohn Memorial Golf Outing. The golfers, and a sizable number of hole and corporate sponsors, enthusiastically contributed over $9,500 to a cause we hope would have made Starr proud. In addition, our president, Mark Kramer, PE made an additional $10,500 contribution to the scholarship fund, so we could meet our three-year fund raising goal in just one year! The names of the winning team were engraved on a perpetual plaque, which is displayed in our headquarters office in Plymouth, to memorialize this special event. This year we held our 10th annual golf outing in Starr's name and raised over $12,000. As of 2018, we have raised over $100,000 to fund engineering scholarships in memory of Starr. The Gail M. Barton Memorial Scholarship program has been established in recognition of Gail Barton who served as SME's Collections Manager with resolve and a keen sense of professionalism for over 22 years; from 1989 to 2011. Gail was a trusted friend and mentor to those with whom she worked at SME. More important, she was a devoted wife and mother. She and her husband, Jim, instilled life-sustaining values in their sons, Phillip and Kevin, and their daughter, Meredith. Gail was very involved in her children's education and often spoke about the importance of putting college studies to good and practical use. She inspired her children to become engaged and productive members of society. SME is pleased to sponsor two (2) annual scholarships to children of SME staff attending college, in honor of Gail Barton — a woman who believed in the value of a college education and who exemplified and lived SME's values every day, with dignity, grace and unfaltering hope. We also established a scholarship through the Community Foundation of Plymouth in the name of our founder, Kenneth W. Kramer, PE to support local students who want to pursue studies in Civil Engineering from a Michigan ABET accredited university. The rain couldn't stop Team SME at the 2018 Metro Detroit Heart Walk this year! We had a great time making a difference while collectively raising over $6,500 to fight heart disease and stroke. A big thank you to our friends, families and colleagues for your support. Since 2010, SME has organized an annual golf outing in the name of a local charity. Proceeds from this year’s outing were donated to Streams of Hope, an organization out of Grand Rapids that exists to foster sustainable change through services that build relationships, meet family needs, and promote a healthier community. All proceeds from the outing went to support the Steams of Hope math and reading tutoring program that serves over 65 local elementary students. 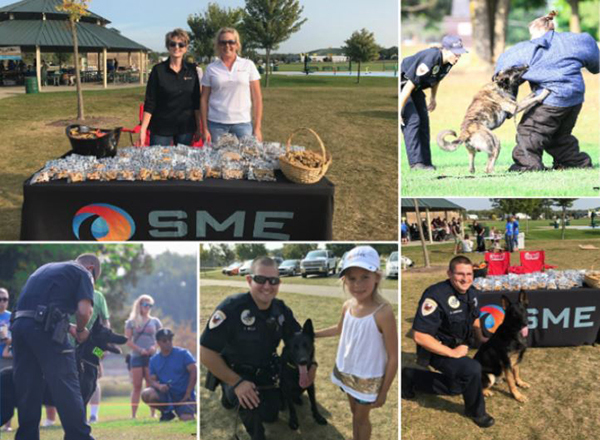 On Saturday, September 16, the SME Grand Rapids team joined the Wyoming Animal Hospital in Lamar Park for their 5th annual K9 Karnival; a fundraiser held in partnership with the K-911 Foundation to support the City of Wyoming Police Department's K9 Unit. Donations from this event will help fund the purchase of training equipment, protective gear, and assist in providing medical care for the police department's K9 teams. Employees of the SME Grand Rapids office collectively raised over $1,000 for the charity! 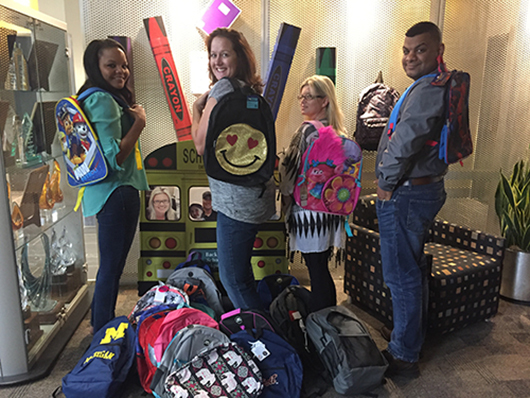 Last year, SME's Plymouth office had its first Operation Backpack event and it was a huge success, so they had to do it again! This year, the team collected 87 backpacks for the Judson Center to help local students get ready for a new school year! Each year, approximately 50 students from across the United States attend a six-week Hydrogeology Field Course at Western Michigan University (WMU). For several years SME has assisted with the field camp and 2017 was no exception. The course is organized by former SME employee Tom Howe, now the geosciences specialist in the Department of Geosciences at WMU. During two summer sessions, students toured SME’s Kalamazoo office soils lab to learn about the engineering side of soils. SME team members Errol Gilbert, CET and Myndi Bacon, PE assisted with the tour and discussion of lab testing as well as geotechnical engineering. SME's Casey Smith and Davin Ojala also visited the students during a classroom session and talked about environmental due diligence and the environmental consulting profession. In addition, Brad Masserant provided a direct push drilling demonstration using one of SME’s Geoprobe® rigs. Each fall semester at Michigan State University, SME’s Christopher R. Byrum, PHD, PE, presents “Introduction to Pavements” in Professor Dennis Welch’s “Soil and Site Development” course to a new class of future engineers. Chris’ presentation targets first and second year undergraduate students in the Construction Management program. Drawing from his passion and years of expertise, Chris provides an overview of pavement systems from the ground up. He shares photos and case studies of challenging real-world construction projects, describes unique aspects of the projects, and shares details of recommendations that solve tough challenges. In this capacity, Chris has been known to ignite a strong passion for engineering in young students, and hopes to facilitate advancement of the engineering field. SME’s Bay City office has been a corporate sponsor of the Wolgast Annual Golf Classic for the benefit of Junior Achievement of Northeast Michigan for several years. All proceeds go to the Junior Achievement Programming, which help local students learn financial literacy, work readiness and entrepreneurship. 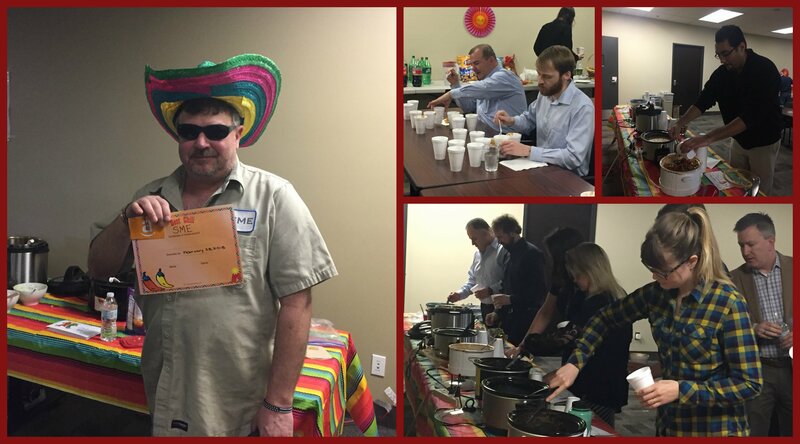 Since February 2016, SME’s Plymouth office warms up with their Annual Chili Cook Off. Employees get a chance to show off their culinary skills and are judged by the palates of their co-workers. All proceeds are donated to a non-profit organization. This year, all proceeds went to the Humane Society of Huron Valley. SME also sponsors the Alzheimer Foundation and provides financial support for the Catholic Youth Organization of the Archdiocese of Detroit. SME has sponsored numerous events and donated auction items through ACEC/M, ASCE and directly with colleges/universities to raise scholarship dollars for college students studying engineering. Several team members participate in career day demonstrations at local schools to encourage K-12 students to go to college and consider careers in engineering and construction, and serve as visiting instructors at local colleges. Additionally, in the spirit of giving at the holidays, each SME office adopts a charity to support making the season brighter for others. SME continues to serve on the Executive Committee for the Annual Building Connections Fundraiser for the Boy Scouts of Southeast Michigan. This fundraiser is sponsored by the Construction Association of Michigan (CAM) and is the largest gathering of the construction community in southeast Michigan. The group donated over $100,000 to the Boy Scouts, which serves over 65,000 families in southeast Michigan. Over 10% of the money was raised by SME and our efforts to secure support from others. We have provided in-kind services to help several communities in Michigan, Indiana and Ohio secure federal grants totaling over $43 million for brownfield redevelopment projects in their communities. For us, it’s invigorating to help communities secure monies that transform blighted brownfield sites into viable and vibrant locations, which in-turn results in profound social and economic benefits. We’ve also provided in-kind services related to community development initiatives, training, and the establishment of Brownfield Redevelopment Authorities. This is a win-win for the communities and SME! SME donated in-kind services to Oakland County Habitat for Humanity in the fall of 2016. A residence in Oxford Township was designed to be ultra-efficient, with external and internal insulation board around the foundations and slab-on-grade. With this design, the Michigan Residential Building Code allows foundations to be constructed above conventional frost depth, which also saves on the cost on construction. The Township required Habitat to retain an engineering firm to verify foundations were properly constructed, and to verify bearing. Senior Consultant Laurel Johnson, PE provided a visual on the state of the excavations and insulation in place, and Engineering Technician Glen Schmeisl followed up to verify bearing prior to concrete placement. SME continues to support Habitat for Humanity by donating in-kind services for new homes, as well as serving on the Habitat Western Wayne County Board of Directors. In-kind lab services have also been donated to the Masonry Advisory Board related to improving masonry veneer materials.